If you are interested in learning a language that you have no knowledge of, then our beginner language courses are perfect for you! 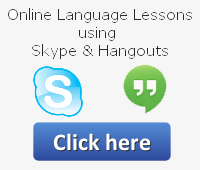 Beginner language courses will teach you the basics of whichever language you choose. With over 30 different languages offered, it is almost guaranteed that you will find the proper language to suit your needs. Beginner courses will teach you topics such as the alphabet, greetings, phrases used in travel, days of the week, and more! You can also learn the first steps of reading and writing in the language of your choice. Please note: if the language you are looking to learn is not listed, please see here for our selection of less common languages.